Shirts can no longer be ordered. Visit the Alamance Makers Guild kiosk on April 13, (at center court) during Maker Faire Burlington to get yours! Pre-Order your 2019 Maker Faire Burlington T-shirt! 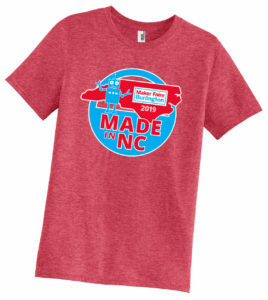 The theme for Maker Faire Burlington this year is Made in NC! Shirts are screen printed on Heather Red. Secure your size… show your support! Order by midnight on Tuesday, April 1, 2019. Shirts will be available for pickup at Maker Faire Burlington on Friday evening at setup and Saturday April 13, (come to the Alamance Makers Guild booth at center court). Shirts may also be available at STEAM Junction prior to the event on Thurs from 1-7pm or after the event during regular hours. It would be a good idea to call first to confirm the shirts have come in, 336-524-3488. Bring your PayPal receipt as proof of purchase to pick up your shirt. Orders not picked up at Maker Faire Burlington will be held for a limited time and may be re-sold after one month (contact us via info@alamancemakers.org if you miss picking up your shirt). Payment goes to Alamance Makers Guild, producers of Maker Faire Burlington. There will be a limited amount of random sizes available at the Maker Faire. All proceeds go towards production of Maker Faire Burlington. Volunteer to Get a Free T-Shirt! Sign up to volunteer for a four hour shift prior to April 1, 2019 and you will receive a free shirt for your shift. Note: If you have ordered your Maker Faire Burlington tee shirt through an outside organization or sponsor there is no need to order your shirt through this form. For multiple sizes use the Continue Shopping link in the upper right corner of the next screen.